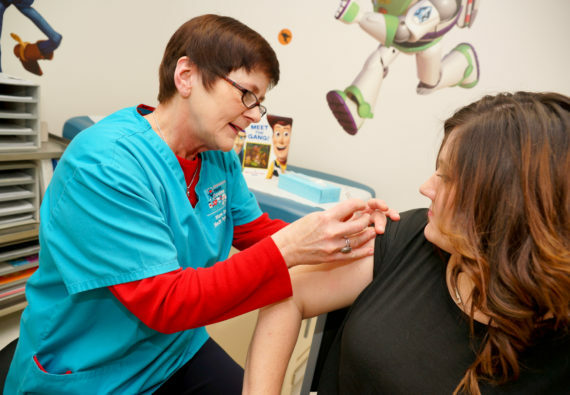 Immunizations are provided by the Mason County Health Department to area residents from infancy through adulthood for a growing number of vaccine preventable diseases. Infants normally begin immunizations at birth while still in the hospital, followed by immunizations at 2, 4, 6, and 12-18 months of age. Immunizations are needed again after a child’s 4th birthday for entry into school. Typically additional immunizations are required for 6th and 12th grades. Please contact colleges for immunization requirements as these may vary. Adult immunizations available include Tdap/Td, Hepatitis A & B, MMR, and Influenza (seasonal). Call (309) 210-0110 to schedule an appointment. Some immunizations are made available through the federally funded Vaccine For Children (VFC) Program who define eligibility guidelines. Children birth-18yrs. are eligible for VFC if they are on a medical card (Medicaid), have no health insurance, are an American Indian/Alaskan Native, or have insurance that does not pay for vaccines. IDPA Medicaid card information or $25 for office visit and $10 per immunization for VFC vaccines. Non-VFC and Adult vaccines fees vary and are available for purchase, but may be billable to private insurance, Medicaid or Medicare if card is presented. *Always bring your current immunization record and insurance information to appointments. * Anyone under the age of 18 yrs. must be accompanied by an adult. * If an adult other than a parent or legal guardian plans to bring a child for immunizations, written consent from a parent of legal guardian specifying what immunizations are requested must be presented. Our clinic forms are available for parents/guardians to print and complete prior to appointments (see below). * No one will be denied service due to inability to pay for government-supplied vaccines (VFC). Non-government vaccines excluded.